In case you missed the news last week, you can now use The Legend of Zelda: Breath of the Wild’s Master Cycle Zero and Champion’s Tunic Link in Mario Kart 8 Deluxe, tying in with the company’s overall plan to spice up the best-selling racing game with additional content. Following its release and huge positive feedback from fans, the game’s producer, Kosuke Yabuki, spoke about the Breath of the Wild content in the game. And, of course, he sounds just as thrilled as we are. “Hello everyone, this is Kosuke Yabuki – producer of Mario Kart 8 Deluxe – speaking. 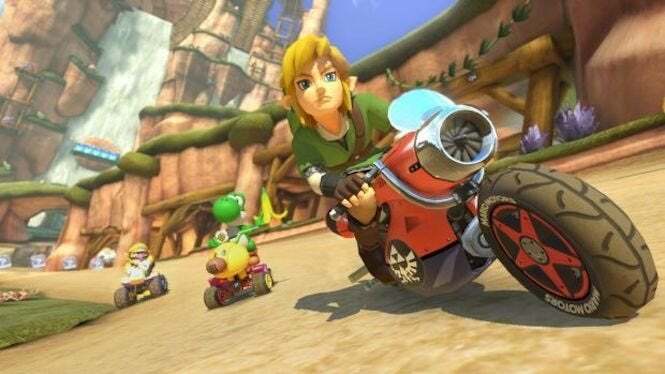 Starting today (July 20th), you can now play as Link from The Legend of Zelda: Breath of the Wild (in his Champion’s Tunic) as well as ride his Master Cycle Zero in Mario Kart 8 Deluxe! Whenever Link performs a jump action in-game, he’ll brandish the familiar Guardian Sword++ as well as utilize his well-known paraglider! And while of course the Master Cycle Zero is a bike, you can choose to use its corresponding kart form as well. The Master Cycle Zero is a trail bike that Link used to ride freely through the wilds, and can execute powerful drifts and jumps, even when underwater! Much of the Mario Kart development team – including myself – has also spent time working on developing titles for the Zelda series too; likewise, members of the Zelda team have also worked on Mario Kart. A lot of us are friends that see each other around the same floor on a daily basis! Just dropping a bike into the world of Hyrule wouldn’t be an easy feat, though. There were a lot of things to consider: making sure the player could feel the tires’ traction, making the engine sound powerful, and even designing the bike to make it feel like ancient technology! The development team faced a great deal of challenges, for sure. After playing The Champions’ Ballad – Breath of the Wild’s second DLC expansion – I felt that the ‘Master Cycle Zero’ would be a perfect fit for Mario Kart 8 Deluxe! To fit with the variety of terrain that the game’s courses offer, such as the anti-gravity sections in which the player drives on ceilings, walls, and the like, we re-appropriated the bike’s mechanics and appearance. Yabuki hasn’t noted what’s set to come next for the game, but fingers crossed it’s just as awesome as the Master Cycle Zero. Sayyyyy...Bayonetta would be a great guest rider in the game, wouldn’t she? Mario Kart 8 Deluxe is available now for Nintendo Switch.